Fiduciary financial advisors committed to the industry and consumers are driving much of the change to the financial advisory industry today. As they educate consumers and spread the word among colleagues about how they deliver value by serving their clients’ best interests, they’re challenging the so-called financial advisors to do the same. If the firm you’re affiliated with doesn’t offer these services in the form of products, you should still provide advice regarding these matters, even if your advice is in the form of a referral to another professional in your network who provides the service. Various self-regulatory authorities and government agencies have been attempting to force an industry-wide evolution toward a single, fiduciary standard of care in relation to working with financial services clients. So far, over the past two years, as this topic has heated up, the efforts have been an exercise that can best be described as three steps forward and three steps back. In the summer of 2018, the U.S. Fifth Circuit Court of Appeals has confirmed its decision to vacate the U.S. Department of Labor’s (DOL) fiduciary rule. Just two years ago, the DOL issued this rule in its final form, with requirements scheduled to be phased in between June 2017 and July 2019. In the regular, taxable account, you could sell products based on client suitability and earn commissions. In the IRA account, you’d have to function in a fiduciary capacity and prove that your recommendations were in your client’s best interest forever, regardless of whether you’re her financial advisor in the future. Having a two-tiered investment account care standard would have been confusing for clients, not to mention for financial advisors, who’d have to overhaul their entire practice to accommodate the expected loss in commission revenues. Meanwhile, many companies took steps to become compliant with the rule well in advance of its 2019 effective date, spending tens of millions per firm on technology and compliance-enabled systems. According to recent news, some of these big firms are set to roll back their announced changes (such as going from a no-commissions-allowed policy for an IRA to permitting commissions once again). In April of 2018, the Securities and Exchange Commission (SEC) proposed a package of new rules and interpretations on relationships between investment advisors and broker-dealers, which is regarded as the SEC’s answer to the failed DOL fiduciary rule. As part of these proposed changes, investment professionals would provide customers/clients a document that discloses whether they’re working in a suitability/customer/transaction or a fiduciary/client/ongoing relationship capacity. The proposal restricts broker/dealers and their financial professionals from using titles such as “financial advisor” (including the alternate spelling, “adviser”) unless they have certain registrations. “Best interest” isn’t defined. The proposal leaves room for interpretation, which makes any potential rule more administrative than transformative. The proposal seems to be calling for a higher care than the current suitability standard, though not as strong as a fiduciary (only requiring some additional disclosure). Brokers can still make more money using proprietary or affiliated products, as long as they disclose doing so and make an effort to reduce this conflict — whatever that’s supposed to entail. The proposal doesn’t create a single, uniform standard for financial professionals. The industry would still have separate standards for advisors and brokers/dealers. Of everything being proposed, the most potent many be the simplest. Restricting the use of “advisor” or “adviser” to only those who have the proper licensing and registration could be helpful. However, for the many financial advisors in the marketplace today who are dually registered (meaning, both a Registered Representative (RR) through FINRA to act as a transactional broker, and registered as an Investment Adviser Representative (IAR) through the SEC to act as a fiduciary advisor), clients still won’t understand when they’re being served by one standard or another because a dually registered financial advisor can switch back and forth depending on the product or service recommended. Furthermore, many financial advisors also hold state insurance licenses. Insurance products typically pay large up-front commissions and have their own separate customer standard of care requirements (usually subject to a variation on the theme of suitability), which varies from state to state. How would a client possibly know that the recommendation being offered is potentially subject to three different standards of care? For this reason alone, manifesting a uniform care standard across all financial services will be a slow process, particularly in relation to investment and insurance products. Although you won’t see any new proposals on fiduciary rules, the Financial Industry Regulatory Authority (FINRA) has been actively upgrading its registration and licensing requirements. The organization has also been doing a great job with a tool called BrokerCheck that enables anyone to search a would-be financial advisor to see if she’s been the subject of any complaints or other unsavory disclosures. The biggest update comes in the form of a new Securities Industry Essentials (SIE or simply Essentials) exam, beginning October 1, 2018. After the effective date, the new exam structure will allow individuals to take one SIE exam, which tests general knowledge (for example, basic products, structure of securities industry, regulatory agencies, prohibited practices, and so on) that used to show up over and over on each Series exam, and then a separate representative-level exam covering responsibilities and functions of representatives. Unlike the current exam registration process, the new process doesn’t require someone taking the exam to be associated with a broker/dealer firm, which is a big win for folks who are interested in joining the industry but haven’t yet been hired by a firm. Minimum age to sit for the exam is 18. Results are valid for four years, giving you time to study for a subsequent securities exam, for a more specific securities license (for example, Series 6 or Series 7) after you’re affiliated with a firm. However, when you read their commentary on the various fiduciary rules and best interest care standards being proposed by the SEC, DOL, or others, their bold clarity of purpose reveals the immense pressure they’re feeling from the large financial services companies who employ the majority of their charter holders and certificate holders. Positive, lasting change will come from within the industry — from financial advisors, including you, who are committed to upholding the fiduciary standard, as I am about to explain. Given the conflicting interests of these industry governing organizations and the added confusion and bureaucracy of federal, state, and local governments, what’s clear is that raising the professional financial advisor industry standard is best accomplished as a grassroots movement driven by practitioners, practices, consumers, and technologies. As FinTech and market demand shift in favor of the fiduciary financial advisor, the large institutions will follow the money. While the industry overall can look forward to progressing in this direction, insurance product sales are routinely left out of the fiduciary discussion. I’m not sure why financial advisors are so hesitant to disclose what they earn on financial products that pay commissions. Clients always want to move forward on executing a solid financial plan, as long as they understand the long-term benefit to them. They want us to make a living, and a good living at that. As long as you’re open and honest about how you’re paid, earnings from insurance product sales aren’t generally a deal breaker. Successful financial advisors should be models of financial success, just as your trainer at the gym has the physique you wish you had. The financial advisor’s model of financial success should be based on compensation and conflict transparency. If you were hiring a trainer, you’d probably want to know whether she looked like she does solely from a disciplined diet and routine exercise or with the help of diet and steroid supplements. That difference would probably be a major consideration in your choice of trainer. The same goes for the advisor-client relationship. To serve clients in the most beneficial manner, an industry-wide standard of care must be delivered. My own firm has enacted The Fiduciary Pledge, joining many other firms around the country, who aren’t afraid to shine a light on any form of compensation or potential conflicts of interest. Unlike many firms, my firm applies this standard of care to both asset management and risk management (insurance) products and solutions. 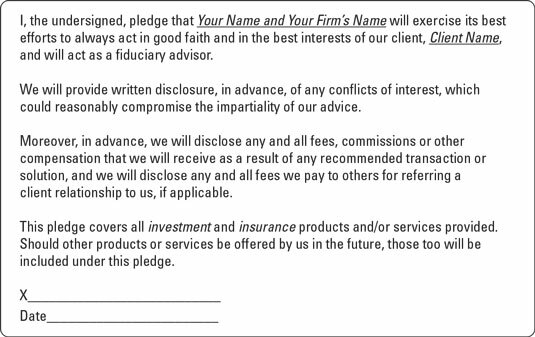 To give you a head-start, use my firm’s Fiduciary Pledge as a model. You can customize it to your own needs, editing as you feel ready and comfortable to do so. The more financial advisors who engage in documenting their fiduciary responsibility and communicating it to prospects and clients, the greater the client flow toward financial advisors who deliver this standard of service. The outcome: A win for you, a win for your clients, and a win for the industry.